Washington, August 31, 2010 /PN - NASA/ Three compilations of images from more than half a century of NASA history are available for comment on a section of the photo-sharing site Flickr known as The Commons. Visitors to NASA on The Commons can help tell the photos' story by adding tags, or keywords, to the images to identify objects and people. In addition, viewers can communicate with other visitors by sharing comments. These contributions will help make the images easier to find online and add insight about NASA's history. The capability to interact with these already-public photos is the result of a partnership between NASA, Flickr from Yahoo! in Sunnyvale, Calif., and Internet Archive, a non-profit digital library based in San Francisco. "NASA's long-standing partnership with Internet Archive and this new one with Yahoo! 's Flickr provides an opportunity for the public to participate in the process of discovery," said Debbie Rivera, lead for the NASA Images project at the agency's headquarters in Washington. "In addition, the public can help the agency capture historical knowledge about missions and programs through this new resource and make it available for future generations." 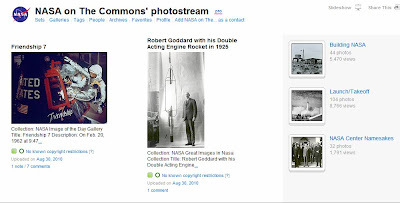 The Commons was launched with the Library of Congress to increase access to publicly-held photography collections and provide a way for the public to contribute information and knowledge. "NASA on The Commons is bringing literally out-of-these-world images to Flickr," said Douglas Alexander, general manager of Flickr. "We are thrilled to be working with NASA to offer such a rich archive and provide amazing insight into this country's space program and its early beginnings." As the project leader, the New Media Innovation Team at NASA's Ames Research Center in Moffett Field, Calif., enlisted the help of NASA photography and history experts to compile the three image sets for The Commons. The group will continue to create and release new photo sets that highlight different elements, themes or achievements. Through a competitive process, NASA selected the Internet Archive in 2007 to organize a comprehensive online compilation of the agency's vast collection of photographs, historic film and video on the NASA Images website. Launched in 2008, NASAimages.org provides hundreds of thousands of images and thousands of hours of video, HD video and audio content available free to the public for download. "Sharing important assets like NASA photography is the core mission of the Internet Archive. Through this partnership with NASA and Flickr, NASA on The Commons is bringing these images to a vast audience and providing an opportunity for the public to give fresh insight and increase our shared knowledge of NASA in all its varied activities," said Jon Hornstein, director of the NASA Images Project at the Internet Archive in San Francisco.